In the show Portlandia, there’s an episode where Peter and Nance visit a local farm, visiting the chickens they’d be eating at a restaurant to ensure they were ethically raised. I like to imagine that’s where this tortilla chicken soup recipe comes from in the Portlandia cookbook. If I don’t have a roasted chicken on hand, I’ll stick 2 pounds of chicken thighs in the oven to broil at 375 degrees F for 20 minutes, flip and roast for 10 more minutes. In a large pot, heat the oil. Add the onion, poblanos, garlic and cumin and season with salt and pepper to taste. Cover and cook over medium heat, stirring occasionally, until softened, about 5 minutes. Add the broth and tortilla strips, cover, and bring to a boil. Simmer over low heat until the vegetables and tortilla strips are very soft, about 5 minutes. Add the cilantro and, using a stick blender, purée the soup until smooth. Add the chicken and hominy and simmer uncovered for 5 minutes longer. 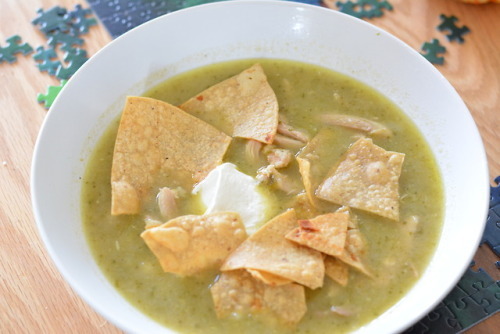 Ladle the soup into shallow bowls and garnish with cilantro, sour cream, and tortilla chips.